Welcome to Meriden Archery Club, a friendly and enthusiastic group of archers. The Club is affiliated to Archery GB and shooting takes place under their rules. 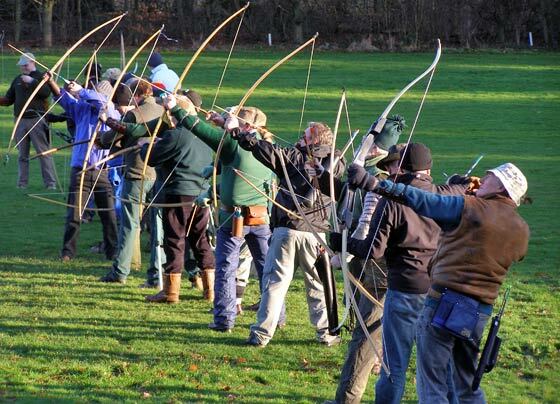 Archers shooting Recurve, Compound, Barebow or Longbow are all welcome at the Club. Nestling amongst trees within the Packington Estate are the Forest Grounds, the shooting grounds of Meriden Archery Club. The Club is almost as close as it can be to the centre of England and is lucky to have its own shooting grounds, open every day of the year and available at anytime of the day. We host Open Tournaments and organise Club Shoots, Beginners’ Courses and Have-A-Gos. Founded in 1936, the Club celebrated its 80th anniversary in 2016. Meriden Archery Club is a member of onTarget, Archery GB’s Club Development Programme. Clubs joining onTarget are making a public pledge to be open and friendly, to advance archery and to proactively work with Archery GB. The Club holds five Open Tournaments each year which are open to any archer currently affiliated to Archery GB. Please visit the Tournaments page for 2019 for dates, information and entry forms. Should you require more information on the Club, or on our activities please visit the FAQ page where some of the most common questions are answered. If you can’t find the answer there, use the Contact page and we will be in touch with you as soon as possible. Meriden Archery Club currently adopts Archery GB Safeguarding Children and Young People Policy and Procedures which can be found here. The latest safeguarding information can be found on the Junior Club noticeboard in the Clubhouse. This is updated with information leaflets for children and parents.